It was a door to another world, an equestrian Narnia, an old curiosity shop. To this equestrian holy of holies were drawn the enthusiasts of the horse world, lovers of good books, those whose fingers itched to touch priceless tomes bound in ancient leather tooled and ribbed and delicately gilded. The shop had a small window crowded with dusty tomes all of them dedicated to the world of the horse. 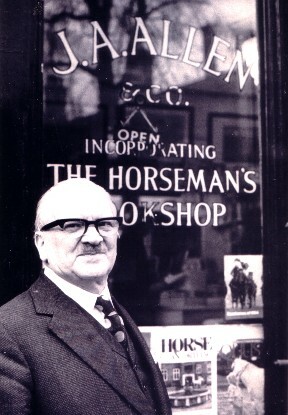 You could get a taxi at Heathrow and ask for, “The Horseman’s Bookshop.” The driver would take you straight there. JAA was on the “Knowledge.” Only the initiate entered and were welcomed. The less knowing were dealt with by Rita, a blond Dutch lady whose bristled with efficiency, she knew every book and every price and every regular who ever stepped into the shop. She terrified me at first, but I grew to respect and like her for her loyalty to JAA and her unending sense of sharp humour. The bookshop was my idea of paradise. The world of horses, traceable, in print, recorded, touchable, studious, fun and above all thick with passion, and all you had to do was reach out and pick up a book. I longed to work there. I had already spent years researching the history of the training of racehorses, which is my passion. I used to go to the green North library of the British Library and there books after book on related subjects were brought to me like some feast laid before me and ready to absorb. The North Library’s silence was broken only by the odd cough and the burr of the trolley wheels. I loved to be buried in ancient books – it was the feel of them and their scent and their secrets that fascinated me. I read Markham and Baret and Vial de Sainbel, I found the writings of Thomas Holcroft, an eighteenth century philanthropist and jockey. I touched these valuable books and fingered the bindings and smelled the scent of ancient linen paper and listened to the tinkle it makes as you flick it through the book, it’s called “handle.” I opened books that were boxes of horse shoes and books like the Anatomy of Melancholy by Robert Burton that I knew I wanted to take home. Suddenly the gods looked favourably on me and I was made redundant from the Design Council. Bliss! I could realize my plan. I wanted a job at Allen’s. I used to wait by the bookshop door and as I saw employees arrive I would quiz them, “Any jobs going?” The door operated an old bell which clanged as you pushed it open. A huge chandelier oversaw the proceedings. Many years later when clearing out the warehouse, I found an old photograph from a house that might have his parents’ home. It was bristling with Edwardian ladies and gentlemen in a glass roofed conservatory styled room with a huge chandelier lighting up a pool table. Vast pots held huge plants. The photograph was faded sepia and the edges had been chewed by mice. It had been stored for years at Bloomsbury in the cellar where JAA kept his books. Finally one day Mr Allen called me up the narrow stairs to his eyrie and I entered the famed office with its roll-top desk strewn with papers and books in every crevice, files bulging with papers. I could not take my eyes off the books, each one with a tantalizing title. He sat me down and there followed a short lecture on the vagaries of publishing, he offered me work two days a week. I was in! It was 1990. But first a little about Mr Allen’s interesting past. His father published the “Sporting Luck.” He died when Mr Allen was 16 in 1926 leaving his son a legacy of a building in Bloomsbury (rented), a collection of equestrian books and probably, judging by JAA’s fondness for it, a large quantity of dust. JAA found himself a bookseller and runner for publishers. He knew my grandfather Charles Spon of E & FN Spon. He published a book of poems by Lawrence Durrell and thereby began a career which was to become a life’s work. In 1938 he took out a lease on No 1 Lower Grosvenor Place. He joined the Royal Artillery in 1940 and served in the Sudan and North Africa and France. He was duly demobbed in 1946 and married a lovely French lady by the name of Pierette. He may well have made some interesting equestrian acquaintances during his time in the Sudan; he certainly would have used any opportunities that would have come his way. He was always on the look-out for what he described to me as people who will work for him for nothing, “because they feel that being published gives them an air of importance and establishes them as an expert. Everyone wants to be published.” he said to me.